The Russia Investigations: Another Oligarch Becomes Embroiled In The Imbroglio Enter Viktor Vekselberg, the latest character to have a role in the Russia narrative. And how did information associated with Michael Cohen's banking records fall into Michael Avenatti's hands? Russian businessman Viktor Vekselberg speaks during the Russian International Affairs Council in Moscow on May 31, 2016. But his "niceness" didn't stop the Treasury Department from putting Vekselberg under sanction in April or from becoming the latest character from that world to take center stage in the Russia imbroglio this week. Avenatti says that money may have come from Vekselberg. That would tie Cohen and Trump in with a powerful Russian billionaire who has the ear of Russia's leaders — a connection reportedly already of interest to Justice Department special counsel Robert Mueller. 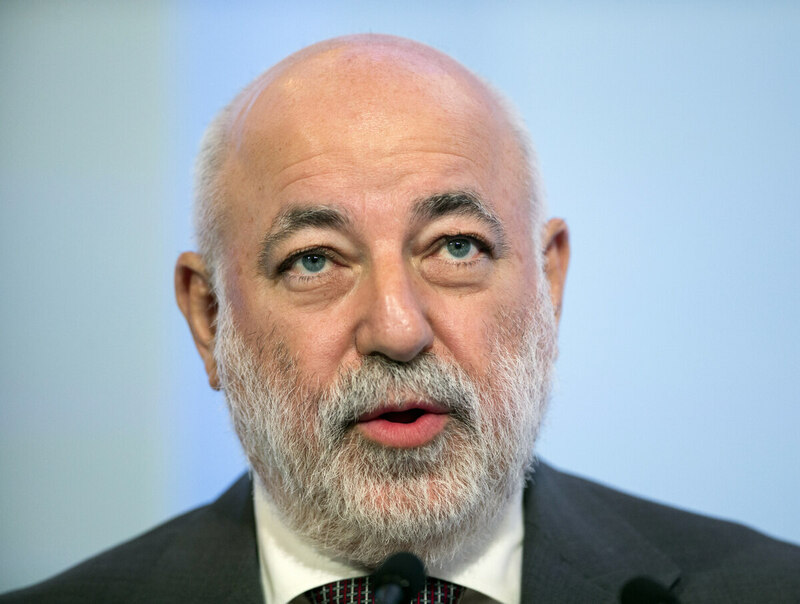 A U.S. investment firm that last year was listed among the "group structure" of a company that Vekselberg controls has acknowledged making payments to Cohen. But it denied that it served as a pass-through for Vekselberg or anyone else outside the United States trying to funnel money to Cohen. The company, Columbus Nova, did, however, register a number of website domains during the 2016 presidential election cycle connected with the so-called alt-right movement, The Washington Post reported. The websites are no longer operational. And Vekselberg has been linked in the past with the activities of Russia's intelligence agencies — by a crew of zany conspiracy theorists that calls itself the Federal Bureau of Investigation. A senior FBI agent in the Boston field office wrote a highly unusual newspaper column in 2014 warning that a Russian foundation that Vekselberg controlled might be a clandestine siphon for Russia's intelligence services to steal cutting-edge technological secrets from American companies, as NPR's Tim Mak reported. The column in the Boston Business Journal appeared in April 2014 and sought to warn Boston-area tech companies and researchers to steer clear of the Skolkovo Foundation, launched by Russian Prime Minister Dimitry Medvedev and run by Vekselberg. The Russians said they wanted to create their own Silicon Valley innovation hub partnered with U.S. companies, but the FBI warned they were seeking to do it at the expense of American know-how. Technical espionage was one of the areas of greatest success by the old KGB during the Cold War. Everything from the atomic bomb to missile and aircraft designs was vacuumed up. The business didn't change after the fall of the Iron Curtain, and the Russian Consulate in San Francisco was a locus for this kind of work targeting Big Tech in the Bay Area and Silicon Valley — until it was closed as part of the recent unpleasantness. None of this adds up to a connection between Russian intelligence agencies and Cohen. At very least, however, this week's news may have revealed a new relationship between Trump world and Russia and shifted this imbroglio in another important way: Now, in part, it's about following the money. Everybody loves to say "follow the money," but it's actually quite difficult for anyone but duly authorized investigators or Treasury Department officials to do so. Wire transfers, bank records and other such materials are not public at best and usually confidential for obvious reasons. So how did they fall into the hands of Avenatti? He won't say. Lawyers for Cohen said in court documents this week they have no reason to believe Avenatti has the bank records lawfully. 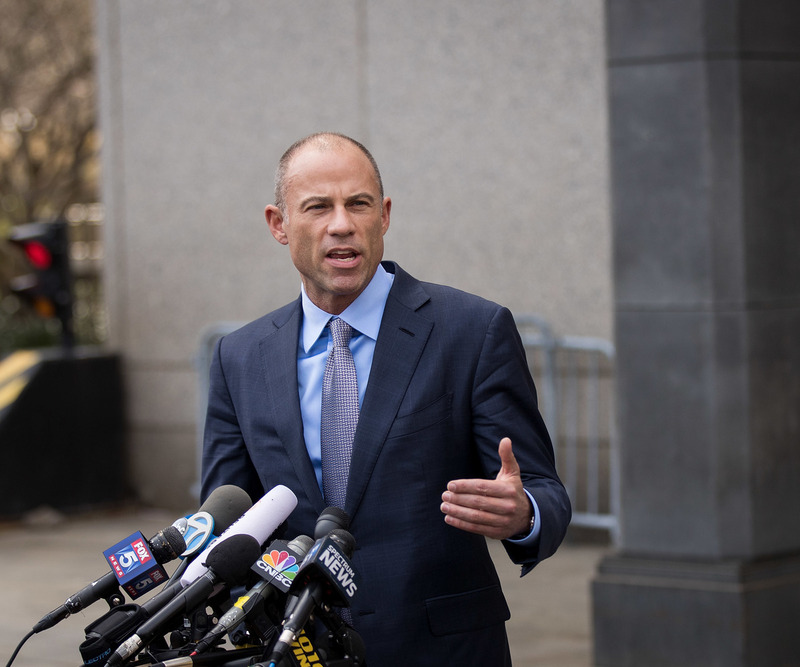 Michael Avenatti, attorney for Stormy Daniels, speaks to reporters following a court proceeding at the United States District Court for the Southern District of New York, on April 13, 2018 in New York City. To the degree that Avenatti wants to hurt Cohen and Trump, at least in the short term, he has: Cohen's apparent side business brokering access and influence in Washington, D.C., has been exposed; two of those consulting clients, AT&T and pharma giant Novartis, have been chastened; and then there is the Vekselberg matter we've already reviewed. But if Avenatti is shown to be laundering confidential information from people in the government that could wind up helping Cohen in the medium term. Avenatti has said repeatedly on Twitter that he doesn't have a political action committee or some other kind of organizational superstructure financing his representation of Daniels. Aluminum tycoon Oleg Deripaska is not described as a "nice" oligarch. He, too, has been placed under sanction, and a news report last week gave an insight into what practical effect that has had: Deripaska has been grounded. Deripaska has returned three private aircraft he was leasing, the Reuters newswire reported. Gulfstream, the company based in Savannah, Ga., that built the aircraft, likely is prevented from continuing to service them or supply spare parts. So Deripaska is canceling the lease on his three G550s and the aircraft are now for sale. That doesn't mean Deripaska can't stay a member of the jet set. France's Dassault makes a lovely executive aircraft — the well-known Falcon — or of course there's Brazil's Embraer or, naturally, Russia's own Sukhoi. The Reuters report does not offer any insight into which of these options Deripaska might prefer, but the news story does illustrate two important points about sanctions, which have become a favorite tool of U.S. foreign policy in the second decade of the 21st century. The first lesson is they do hurt — somewhat, for a while. This individual, Deripaska, is being forced to change his behavior. He has been inconvenienced, and he can't carry on in the way to which he had become accustomed. His economic health and that of his business have taken a serious hit. The second lesson is that, in many cases, people adapt. If you're a billionaire business mogul in the market for a new business jet these days, you're spoiled for choice. When Deripaska is ensconced in the luxe cabin of his new Falcon 6X, let's say, reviewing new aluminum swatches as he skies down to Ekaterinburg, the restrictions he is under may feel much less urgent. And for the purposes of the United States, Russian President Vladimir Putin hasn't been prompted to change his approach toward the West. One premise of sanctions on the powerful Russians who owe Putin their fealty was apparently to try to get them to get him to change. But even if their lives now are tougher than they would like, so far neither they nor Putin have budged.